When you are just getting started couponing it can be hard to figure out how to stock up with no extra money in the budget. I thought I would show you just how much you could buy for less than $15. The following is an idea to help you reach the $50 purchase needed to use the in-ad coupon this week for $10 off a gas gift card. The in-ad coupon is only good Friday to Sunday, so that means if you want the gas promotion then this scenario will only work on Friday. I’ll work on another scenario for any weekend shoppers. I can imagine for some of you though, the gas gift card is not really in the budget either. So just use this as a way this week to save a ton off a number of regularly used items. 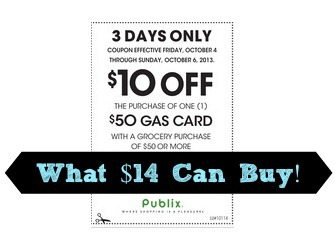 All of these deals I pulled using the Publix $1 or less list. After Ibotta you have everything above for only $14.17! !